We are witnessing great changes in the real estate industry, which are being influenced by macroeconomic trends and regulation. This in addition to significant demographic shifts, the rise of the millennial generation with their on-the-go lifestyles, an aging and downsizing baby boomer generation, heightened urbanization, as well as a period of technological transformation. With all of this change, the Association of Foreign Investors in Real Estate's 2016 survey still marks the US as the most favored destination of real estate investments by foreigners. In the last year, we have seen a rise of 11.4% in apartment real estate, 8.2% in commercial real estate, and a 12.6% rise specifically in office property prices in CBD's. A far cry from where we were almost 10 years ago when the housing crisis hit. It can safely be said that we are well beyond the rebound from the 2007/8 crash with this past December's prices at almost 24% above the peak of the pre-global financial crisis figures. Commercial real estate assets have performed well with an annual gain averaging 9.2% (Moody's/ Real Capital Analytics – All Property Index). When comparing today's prices to those of the last peak in 2007, we see a rise of 49% for CBD office properties. The improving jobs market and low unemployment rate continue to boost consumer confidence. 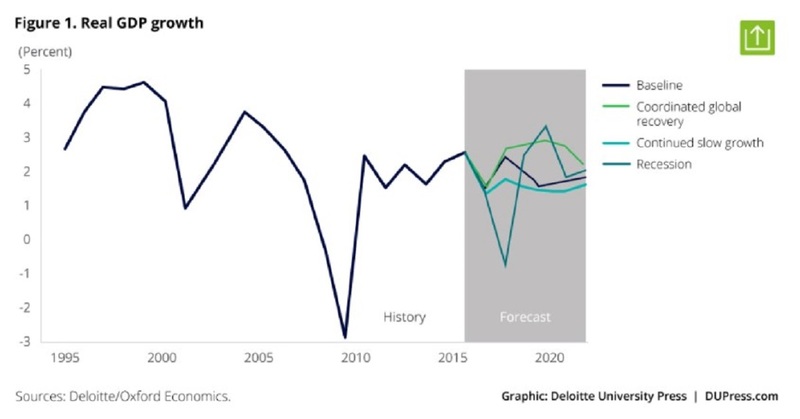 The GDP, according to Deloitte's Q3 2016 US Economic Forecast is set to modestly grow by 2.5% this year which could potentially signal a slowdown in commercial real estate activity. In general commercial real estate transaction volumes have had an apparent decline of above 9%, whereas the multifamily residential sector is displayed continuous year after year growth of 4.3%. Commercial real estate sellers are currently more interested in certainty of execution over just going with the highest bid, with the financing market currently being led by asset acquisition rather than refinancing. America still remains an attractive market for global capital and all in all, the deal flow is still immense. Commercial asset pricing continues to be stable despite the slight decline in transactions. Many questions arise regarding the Trump administration and how its future policies will affect real estate as a whole. Could we be entering a period of de-regulation and a turn back on Dodd-Frank? Of this we cannot be sure, however we can probably bank on it that interest rates will continue to go up. As the economy is strong and steady, we are bound to still enjoy a good yield from commercial real estate, even if there were to be a heightened impact which affected the market, when comparing to a 10 year yield from US treasuries. With the growing shift of consumption moving to ecommerce and continued rise of the mega chain stores, medium commercial real estate and mom and pops stores are undergoing a hard time to compete. On the other hand, technological advancements and startups feeding off the rise of ecommerce, are sprouting up endless companies that provide services in this very sector and they require lots of office space. Commercial real estate owners have had to adapt to the times and creatively cater for a changing work culture where an office is no longer the place that you only work, but also the space that you play in. Technology advancements and trends will continue to affect commercial real estate for the time to come. One of these growing technological trends is the social investment platform where online real estate investments take place with ease, security, speed and professionalism like never before. At iintoo, you can choose your real estate deals according to asset class and locality, and acquire equity from as little as $25,000.